Curious why they aren't allowed to even so much as touch a conker? Like you said, its just one of those signs of autumn & something generations of little boys have plkayed with. Lovely story though! I like your confession. I was anticipating you saying that your collection was attained by confiscation. I should have known better! P.S. I think I will soon be prevented from leaving comments - the verification is getting so hard to read. I still get excited searching for conkers, the grandchildren have to humour me!! Gosh!! what ever happened to the days of collecting conkers, soaking them in vinegar, baking them in the oven and getting your dad to skewer them.....all this to at least get a six-er!! Many a play/ lunch time was spent playing conkers and keeping score. I'm glad you're a soft touch :) great story!!! Definitely a tricky thing to be a Conker Nazi! I'm missing the collections of conkers this year as Princess isn't coming back from school with pockets full. Hmm, wonder if she's collecting any at Uni? I think it's rather sad that kids can't play with conkers at school any more....so pleased you're a bit of a soft touch!! 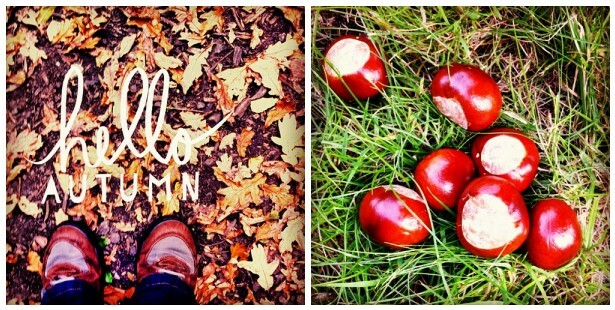 Autumn, conkers and boys of any age just go together; I'm so glad you were lenient with him. So sad that they can't even collect them, but then if they had them in their pockets they would be tempted to do things with them which they shouldn't whilst at school! Glad you were a soft touch though! Oh bless him. I'm glad you went soft with him. I love conkers, they are so beautiful. Love your story. And love that it lead me to look up what a game of conkers looks like. Not sure it is (or was) ever played anywhere in the U.S. But I certainly understand the appeal of those shiny seeds - they beg to be touched. It does seem harsh but I guess that rules are rules. I love that you break your own rules. When I was an NQT and Friday hometime rolled around we would get giddy and have cartwheeling contests down the school corridor - if only the kids could have seen us! Now I doubt I could cartwheel anymore! Must be chestnuts! Look lovely though! We have acorns ourselves and I love them to bits! Thanks for being a cool teach! I'm pleased that you're a soft touch, it doesn't seem fair that they can't collect conkers. It seems like an impossible request to resist. Glad you are a bit of a soft touch!